If you're looking to create some WebM videos to try out the new WebM support in Firefox 4 Beta 1, an easy tool to use is Miro Video Converter. 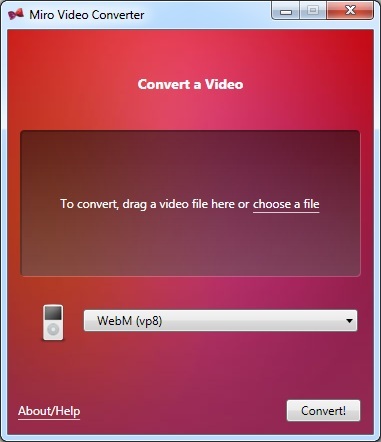 Because WebM is such a new format, existing video editing software doesn't encode in WebM yet, so if you want to make a WebM video, you must create it in another format and then convert it to WebM using a tool like Miro Video Converter. Miro Video Converter provides a very simple interface for ffmpeg, one of the leading open source video encoding tools. Miro Video Converter configures ffmpeg to output converted video to the same quality as the input, and it uses the excellent xiph.org libvorbis audio encoder, rather than ffmpeg's own broken Vorbis encoder (if you hear poor quality audio on YouTube WebM videos, it's probably because they're still using ffmpeg's vorbis encoder). Miro Video Converter is freely available for download on Windows and Mac, and can convert to other formats besides WebM. The new Firefox 4 Beta 1 includes support for HTML5 video elements playing WebM videos. This is exciting, as much of the industry is getting behind WebM. Opera is shipping WebM support in Opera 10.6, Google Chrome's "early access release channel" builds include WebM support. Microsoft said they'd support WebM in their HTML5 video implementation in their upcoming IE9, provided appropriate codecs are installed on the user's system. Adobe has announced that they'll support WebM playback in Flash, which will provide fallback playback of WebM in any older or otherwise non WebM supporting browsers. Intel says it will move towards hardware support for WebM once it becomes popular. Google has freely licensed the VP8 video codec used in WebM, and provided a royalty free patent grant. This is great news for the future of the internet. We now have a royalty free video codec, with quality which is competitive with proprietary alternatives. This means anyone can freely use high quality internet video, without having to worry about getting sued or having to negotiate a patent license. All this will hopefully contribute to increased adoption of WebM and HTML5 video, coupling all the power of the modern web browser's rendering pipeline with high quality video. If you want to try out our new WebM support in Firefox, the easiest way is to download the Firefox 4 beta, and watch WebM videos on YouTube's "HTML5 Experiment" program.